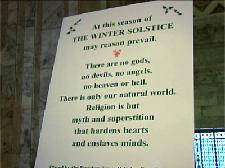 The photo on the right depicts the display which was placed at the Washington state capitol building beside the manger scene and other symbols of the holiday season. It made news because it was so offensive to Christian groups, and at one point the original display was stolen from the capitol building. The words on the display were found to be offensive by so many because that was the intent of the group that placed them there. And their offensive language is evidence of the offense they took at the other displays in the rotunda area. The other displays were more or less innocuous and innocent because that was the purpose of the groups that posted the displays. Not so with this group. They had been offended, and they intended to offend purposefully in return. That brings to mind the purpose of this blog today which is to examine the ease which which we take offense these days. We have become a society of easily offended people. It seems that everything bugs us these days. Consider the other news item we hear about these days. Some stores have instructed their employees not to utter the phrase "Merry Christmas" to customers in order to avoid offense. In fact, some stores are playing down the whole Christmas theme supposedly to avoid offending customers. Naturally, this has produced a backlash among offended Christians who are resorting to saying "Merry Christmas!" with almost an edge to their voices everywhere they go. If someone dares to say something that sounds the least bit negative in response to their holiday outburst, they will go apoplectic in return. And heaven help the poor store employee, who under orders from the boss, says "Happy Holidays" or some other neutral phrase in an attempt to be somewhat "holiday-esque" in their verbiage. Could we not all just chill out a bit when it comes to being offended by any little thing we see or hear? The Apostle Paul recommended that we forbear with one another. (Eph. 4:1-3) This may have been intended for folks within the church fellowship, but could it not also have a wider application that might go beyond church walls? In our holiday exuberance could we not forbear with those who might celebrate other holidays like Hanukkah, Kwanzaa, Winter Solstice, Muharram, "Festivus for the Restivus"? If I were to wish someone a "Merry Christmas" would it be a huge crime for them to reply "Happy Hanukkah" to me? The other day at Star Bucks, I was walking across the parking lot to get from my car to the store. I walked in front of a car in a long line wrapped around the store to order something from the to-go window. There was half a car length between their front bumper and the car in front of them, but when I stepped between them and the next car they honked at me. Never mind that they were at least 15 or 20 minutes away from even placing their order. My two seconds in front of their bumper was an affront to them resulting in an irritated toot of their horn at me. I offended them by walking in front of their car. And what was my response? I was offended that they were offended. My mind began conjuring up possible overt responses: everything from verbal epithets to sign language to possibly sitting down on their hood materialized in my imagination. Fortunately, I wound up doing nothing from the list of my imaginations. I walked on in the store saying and doing nothing. I didn't even scowl at them. My perverse side did wish, however, that I had at least said "Merry Christmas!" to them. Just a merry little thought. Teaching a lesson today, I was reminded about something from my former youth ministry days many years ago. There were a couple of boys in the church I served who generally came to church with their parents, but who never participated in any youth group activities or other church events. I invited them to participate but they never showed any interest. I asked their mother about the situation and she finally confessed that both boys preferred to stay home and watch TV and play video games over going anywhere and doing anything outside the home. It wasn't just a disinterest in church functions or youth events. These boys never went out doors to do anything. I don't know what ever happened to them, but I lamented being upstaged by a cathode ray tube attached to a TV tuner or a game controller. Since that time computers have been added to the arsenal along with mp3 players, game boys, cell phones, Wii, X-box, etc. Everything seems to have a video screen attached to it. The lure of the screen equipped device seems almost irresistible. 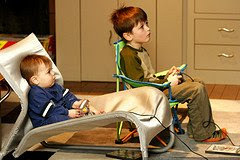 I have a young grandson who loves to play Super Mario. Since we aren't equipped with that game at our house, I'm not sure how he will be able to subsist visiting our place without it being available. I've said all that to present this point. The video screens on all these devices provide a visual medium for today's society that could be reminiscent of the idolatry of Old Testament times. Read anywhere in Old Testament history and you will notice the proliferation of household idols. A good example of this would Be Jacob, Leah, and Rachael's departure from Laban in Genesis 31. Among all the other things we read in the text, we discover that Rachael stole her father's household gods, and the implication is that she took them because she felt entitled to them because her father had mistreated her husband. The idols represented some of the household wealth, and Laban made a point of inquiring as to the whereabouts of the household gods. Folks back then didn't have access to videos, but I would assert that hand held idols were the closest thing to a game boy available back then. Idols were a visual representation, an action figure of sorts, to the metaphysical realm. Not only were they considered valuable, but they were evidently in continual use. Never mind that when the 10 commandments were handed down from Mt. Sinai, that prohibitions on Idolatry were among the first pronouncements. Luke 9:46 An argument started among the disciples as to which of them would be the greatest. 47 Jesus, knowing their thoughts, took a little child and had him stand beside him. 48 Then he said to them, "Whoever welcomes this little child in my name welcomes me; and whoever welcomes me welcomes the one who sent me. For he who is least among you all—he is the greatest." Jesus used a child as His example, but the general principle is – be kind and helpful to the least important people you may meet. Fill each and every day with thousands of small, minuscule, mundane … seemingly random … acts of kindness. Make it a way of life. That way of living means we have to be willing to be interrupted. Most random acts of kindness won’t show up on your “to-do” list. These opportunities have a way of surprising us … sometimes in our busiest moments. I had one such unscheduled event a while back when a man came to my office asking if he could do some work so he could earn some gas money to drive back to Austin where he lived. For some reason this man touched me, and I invited him to tell me his story. It was too involved to share it all here , but it involved the fact that he and his wife had argued and he left home planning to have nothing more to do with his family. While here in San Antonio he had a chance to rethink his decision and now he wanted to go home and try to make things work with his wife and be there with his kids. I spoke with him for two hours, took him to lunch, had him do some work for me so I could pay for his gas myself, and finally prayed with him as I sent him on his way back to his family. Nothing I said that day changed his mind, he had already decided what he needed to do. The most I can say is that I was able to be a Christian brother to him that day and to encourage him to do what he already knew in his heart to do. And his desire to do the right thing also encouraged me. It took up half a day I hadn’t intended to spend that way, but I felt like I had really done ministry in a way that made a difference in someone’s life, and believe it or not, his words also inspired and encouraged me. This is Gracie. She is a philly who is having a terrible, horrible, no good, very bad day. 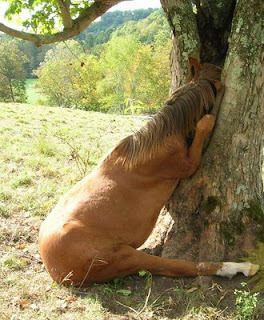 She wandered over to a tree in her pasture, got curious and inserted her head into the v-shaped opening in the tree to see what was there. Now she is stuck and after struggling to get out she is so exhausted she just sat down, very unlady like and is whinnying out her woes. The good news is that a nice man came along the day Gracie got stuck and, after taking a picture or two, he got his chain saw and cut her face out of the tree. There is a happy ending to this story. I used this photo in the introduction of a sermon entitled, "How to have joy no matter what." in order to give a visual representation of what "no matter what" might just look like. Have you ever had a day like Gracie seems to be having? Sure you have! Did you manage to get through that day or did you stay forever stuck face first in the tree? Chances are that somehow, one way or another, you extricated yourself or else were extricated by a nice man with a chainsaw. Either way, you got out of your "no matter what" situation. Consider Paul's advice in Phil. 3:4-7 "Rejoice in the Lord always. I will say it again: Rejoice! Let your gentleness be evident to all. The Lord is near. Do not be anxious about anything, but in everything, by prayer and petition, with thanksgiving, present your requests to God. And the peace of God, which transcends all understanding, will guard your hearts and your minds in Christ Jesus." Here's hoping that you will develop the ability to rejoice even in "no matter what" situations. Just a thought. Ed S.